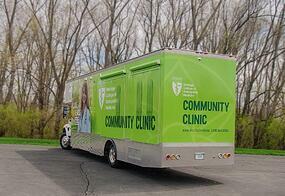 From Blood Donor Mobiles to Mobile Health Clinics! As the leading manufacturer of mobile units for health care, LifeLineMobile is proud to have customers all over the world that provide quality healthcare and laboratory services. Here are just a couple of examples…. Founded in 1943, Blood Systems is an internationally known leader in transfusion medicine founded on the principles of quality, excellence and service. Blood Systems’ Mountain Division includes Bonfils Blood Center operations in Colorado and United Blood Services operations throughout Wyoming, western Nebraska and southwestern South Dakota. The combined organizations operate an average of 250 monthly blood drives. Together, Bonfils Blood Center and United Blood Services need to collect approximately 3,500 blood donations each week to support patients at nearly 140 hospitals and healthcare facilities. 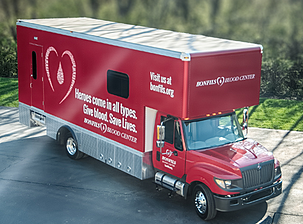 To supplement the Mountain Division fleet of 48 vehicles, Blood Systems has selected LifeLineMobile to manufacture eight blood donation mobile units following a competitive RFP process. Blood Systems is one of the nation’s oldest and largest nonprofit community blood service providers, with blood centers serving more than 1,000 hospitals across 28 states to provide comprehensive transfusion medicine services for patients in need. * To learn more visit: Bonfils BloodCenter, United Blood Services and Blood Systems or call 1(800) 288-2199. Heritage College mobile clinics are staffed by certified nurse practitioners, volunteer physicians and students. Services through Community Health Programs are provided throughout a 21-county service area in medically underserved southeast Ohio. According to Carole Merckle, BSN, RN, DTR, CDE, Interim Director of Community Health Programs at the Heritage College, they chose their first mobile medical unit from LifeLineMobile over 20 years ago. Because of their exceptional quality and responsive service, the college felt LifeLineMobile was the best choice to provide highly professional medical care to the rural communities they serve. Their first mobile unit from 1994 has since been retired, yet the Heritage College is now on the road with two newer mobile medical clinics from LifeLineMobile. * To learn more, visit the Community Health Programs website or call 800.844.2654.